When the Pilgrim Fathers first landed in America, amongst them was a coven of white witches from an ancient society known simply as the Sisterhood. These secretive protectors of Humanity consisted of female Arcanists from select bloodlines and their male relatives who acted as their protectors and guardians. Joining this Faction means your Posse is led by the powerful white witches of the Sisterhood, in tune with the Arcane balance of the natural world. Alone, they are vulnerable – when used as a Coven, their mastery of Arcane Power grows exponentially! The Salem Sisterhood is made up of 8 figures: 1x Maiden 1x Crone 1x Mother 1x Guardian 4x Gunfighters (2 with pistols, 1 with Shotgun, 1 with rifle). 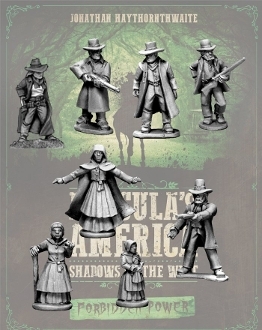 The Gunfighter Miniatures are taken from Artizan Design Wild West packs.